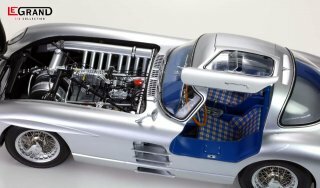 LeGrand 1/8 model kit LE102 Mercedes SLR "Uhlenhaut Coupe"
LeGrand 1/8 model kit LE102 Mercedes-Benz 300 SLR "Uhlenhaut Coupe" (1955). 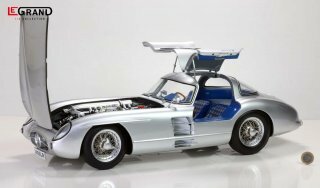 Pocher importer LEMKE is already announcing a sensational new kit for 2020: Mercedes-Benz 300 SLR in the large scale 1/8. The soon available Volkswagen Beetle convertible should only be the entry into a series of new 1/8 kits. The preliminary highlight of the series is the "Uhlenhaut Coupe" from 1955. Not to be confused with the well-known Mercedes 300 SL Gullwing - the 300 SLR is a thoroughbred racing car with an 8-cylinder in-line engine. According to LeGrand, the kit level in terms of difficulty should also be suitable for non-professionals - almost all parts are screwed and therefore the assembly is relatively easy to accomplish. The pictures show pre-series hand samples, (c) LeGrand or Tecni-Art. The final series product may differ in details. Orders: We are already accepting your orders. The planned price for this model should be Euro 998.00 - below Euro 1000. Until the start of sales in mid-2020, we grant a pre-sale discount of 5% on the final sale price. Payment is not necessary when placing your order - we will notify you shortly before the delivery of the kits and name the final price with discount.